You are here: Home / Health Rights / Extreme Couponing. Is it the New Addiction? Couponing Pros & Cons. Extreme Couponing: Pros and Cons. We all love coupons — the prospect of saving money in harsh economic times. But is Extreme Couponing addictive? Is there a dividing line between savvy couponing and Extreme Couponing? There’s a show about Extreme Couponing on cable. We see women (and a few men) spend the majority of their waking hours cutting coupons from four or five newspapers, finding and printing website coupons and filing coupons. They organize the coupons in large binders, often several binders. Tiny tots cuts coupon for fun. A few hours a week, perhaps even daily, they force their kids to do the same. Tiny tots, only 4 or 5 years old. Kids of all ages. We’re told the children love it, that they’re enthralled by the “life lesson.” Give me a break. Did you love sitting at a table for hours at a time with your mom doing something so boring when you were a kid? Shouldn’t they be out playing, doing homework or just being kids? Extreme Couponers attack. They drive to the store and buy thousands of dollars of goods they can’t use or won’t use for years, for nothing or close to it. We see them doing this repeatedly. They don’t purchase the healthiest food for their kids. No, they buy boxes upon boxes of cereal full of sugar, just because these brands are on sale. Cans contain aluminum. Aluminum is not healthy. An occasional can of food or soda won’t harm you. But a diet of canned foods and soda can reduce the years and/or health quality of your life. So far as we see on the show, that’s what their children live on. Note – and this is very important. The televised Extreme Couponer is never observed stacking a cart with fresh fruit and vegetables for her children. Stores and websites don’t coupon perishable items as frequently or generously as they do non-perishable goods. The Extreme Couponer leaves the store with 4 or 5 carts. But there is little or no fresh food in her/his cart. Not even milk. What are their children eating? Canned foods, candy, sodas, junk? Extreme Couponers are indirectly taking money from the pockets of fellow buyers. How? Let’s say you heard about a sale on bottled water, but the Extreme Coupon person got there first. She doesn’t buy 7 or even 14 bottles for the week. No, we observe the couponer throwing every available bottle into her cart. Hundreds of bottles. The shelf is now bare. I’ve seen entire shelves remain empty for days, perhaps even a week, before the store can restock. You’re forced to waste time and gas on a follow-up visit or find another store with the same item. The Extreme Couponer picks up a hundred or more of the same item, just because she/he can. Many resell it. A few, we’re told, give a portion of their stash away to soldiers and families in need – or just kids in the neighborhood who enjoy a treat. 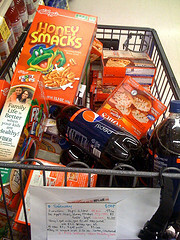 The Extreme Couponer can take a half hour or more to check out – given all the items and coupons to be scanned. Frequently, the cash register breaks or shuts down from excessive coupon scanning. Then the check-out clerk is instructed by a manager to count all the coupons by hand. (Bet she/he loves that job.) Meanwhile, you’re left waiting in line or with one less register to help you save time. An Extreme Coupon hoarder returns home and stacks her goods in every available corner, including the living room and one or more bedrooms (a child’s bedroom, naturally). She’s ecstatic. The house looks like a Seven Eleven. Cardboard boxes, cans, stuff which emits chemicals into the air and decomposes over time. The family is breathing Coupon Addiction night and day. No matter. The Extreme Coupon hoarder is able to save enormous sums of money. The costs in health, quality of life and consequences for your life are not important. One thing is certain: One a person takes this path, there’s no turning back. Healthy activities, creativity, education and/or professional endeavors are pushed to the back of the proverbial shelf. Extreme Couponing can become your chosen field for life. It’s addicting.